Unique to you and no one else can use your URL. One URL that works for both your website and app. A seamless transition between the two. 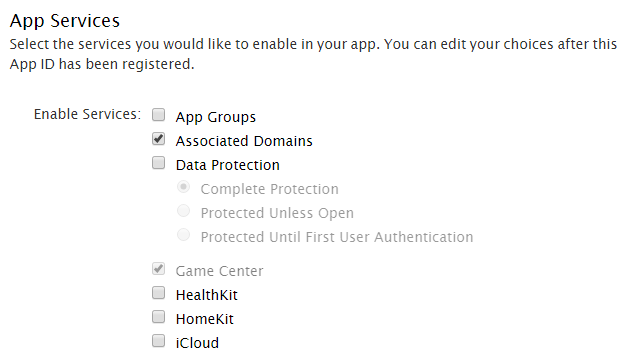 In order to use Universal Links you need to enable Associated Domains in your AppID profile. You can tick it when creating your AppID or edit an existing AppID. Please note that if you edit, you may need to regenerate profiles based on that App Identifier. This is all done in the Apple Developer Portal. Take note of your App ID Prefix (TeamID) for use later. In order to use Universal Links you must have a corresponding website for your app and the ability to upload a file to it. If you don’t have a website then you can not use Universal Links. We need to create an association file that lets Apple verify that you are the owner of the domain. You need a new association file for each domain and sub domain. Must be no greater than 128KB even when signed. Replace the appID with your AppId, prefixed with your AppID prefix as I mentioned above. Next you can add in the paths you want to associate. Enter in the path names, do not enter any domain names. Upload the file to the root of your website domain or create a new directory called .well-known and place the file in there. As a final note please do not add an extension to this file such as json or txt, it must have no extension. Then in your Associated Domains add in the domain name you wish to associate. Note: This must be prefixed with applinks: as shown below. When an iOS app is loaded from a Universal Link, you can override the ContinueUserActivity in AppDelegate.cs to get the URL passed. From here you can them move around in your app as needed. If your app is not running, it will get called through a different method. If you want more specific details on how to configure Universal Links, check out Apple’s Support Universal Links documentation. This doesn’t work when app is not running in the background. Hi Ali. I have just updated the article to show you how that is done. When the app is not running in the background, you need to use the OpenUrl method which is shown above. Do i need a SSL certificate for universal links to work? Great post, like everything else I’ve been reading. Right now I’m implementing Deep Linking in a couple of applications with Xamarin. Forms, and I have a question. I have followed this specific post, and I have already managed to get one of the applications to open the other, but I need to go further and it is not clear to me. What do I have to do from there to open a specific page of the application? And then I pass the parameter to MainPage, which manages navigation to the page I want to reach, but I’m not sure it’s the right thing. I have not yet found a viable solution in iOS… What do you think?